The latest weekly United States Mint numismatic product sales report includes the debut figures for the Homestead National Monument of America Quarter bags and rolls as well as the Harry S. Truman Presidential $1 Coin Cover. 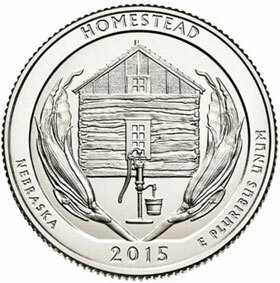 The US Mint began accepting orders for the Homestead Quarter numismatic bags and rolls on February 24, 2015. This release date came after the initial release into circulation and the official launch ceremony for the coin. The various numismatic product options available included circulating quality coins from the Philadelphia, Denver, or San Francisco Mint facilities. The circulating quality coins from the San Francisco Mint with the “S” mint mark are not released for general circulation, but only available within the numismatic bags and rolls. Across all options, the opening sales figures accounted for 659,900 quarters from the Philadelphia Mint, 659,200 quarters from the Denver Mint, and 686,080 quarters from the San Francisco Mint. On February 26, the US Mint opened sales for the Harry S. Truman Presidential $1 Coin Cover. The product represented the twenty-third release within the ongoing American Presidency $1 Coin Cover series. Through the reporting date, sales have reached 10,941 units. This figure already accounts for 72.94% of the production limit of 15,000 units. In its second appearance within the weekly reports, the 2015 America the Beautiful Quarters Silver Proof Set added 7,809 to reach cumulative sales of 54,490. Notably, the total sales are now ahead of the clad version of the set which has reached 51,722 during a longer period of availability. many of us know that the sales figures are available on the usmint internet-site. But I like to see the report and comments about it here. So hopefully the author of the report here is not ill and delivers the most recent figures. and lots of thanks for all the past reports. yes, i agree. I like these synopsii (sp?) each week. Mintnewsblog is still posting, so unless someone is posting for Michael, i assume he is allright.